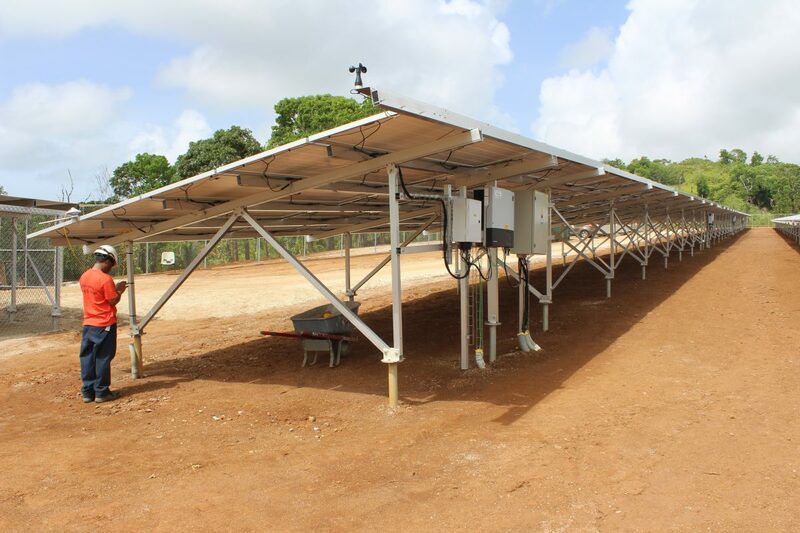 The objective of the 600 kWp Pohnpei solar PV project is to introduce diversity to the island’s energy mix as well as provide additional energy to fuel the country’s growth. VERGNET, as a global renewable energy solutions provider, won, after a competitive tender, the contract to design, engineer, procure, build and commission the solar photovoltaic plant. The PV plant is the largest one in the Federate State of Micronesia (FSM) and the third collaboration between VERGNET and MASDAR. MASDAR was appointed to fund and execute the project on behalf of the governments of the UAE and FSM, in coordination with the Pohnpei Utilities Corporation (PUC). The Pohnlangas solar farm contributes to PUC’s goal to reach 100% renewable energy for power generation. For the successful delivery of the plant, VERGNET had to build up on the Group’s long-time expertise of island projects to address the specificities of the project. This involved in particular to take into account the remote nature of the site in order to complete the plant within the expected timeframe. Like most VERGNET projects worldwide, the use of local means and competencies is always a priority. Instead of importing specific machinery for the screwing of the foundation piles, a customized tool was developed, with a proper interfacing suited to locally available equipment. This adaptation allowed to contain the costs and once again to secure the project planning. When local resources are not available, as it was the case with limited availability of some of the materials to build the concrete buildings, it was for example decided to manufacture the housing for the delivery substation abroad, and ship it to Pohnpei. This allowed to secure the planning while ensuring the highest manufacturing quality standards. The project also involved VERGNET to set up a complete capacity building program to the operation and maintenance of the plant to the local teams of the Pohnpei Utilities Corporation (PUC). During the construction, VERGNET thus actively involved PUC staff (electricians and mechanics) to allow them to fully understand the installation of the PV plant, which was much appreciated by both the Utility and MASDAR. Vergnet is a global renewable energy solutions company with a successful track record in providing high performance, reliable and affordable clean energy solutions for companies around the world. Advanced renewable solutions, encompassing wind, solar PV and hybrid technology, make Vergnet a recognised partner of choice for mining companies throughout the world. The company leverages a 25 year heritage in delivering power quality, performance and availability of supply in remote, isolated environments with extreme climatic conditions and limited electricity infrastructure. With a strong focus on design, manufacturing and engineering innovation, Vergnet provides adaptable renewable solutions that are highly customised to both the local environment and the specific needs of mining companies. Vergnet’s uniquely designed technology is adaptable for grid-connected as well as off-grid operations and has been developed specifically for extreme weather conditions providing reliable, efficient and scalable energy solutions. Vergnet operates in over 40 countries and has 166 employees in 10 offices. Developing adaptable and affordable solutions that cut energy costs is at the heart of everything we do.